Sometimes, I will be posting cute dog photos that I find online (or cute dog pictures that are sent to me by friends and blog readers). Mama and I ran across this great photo from Pinterest. It’s our Happy Thought of the Day. 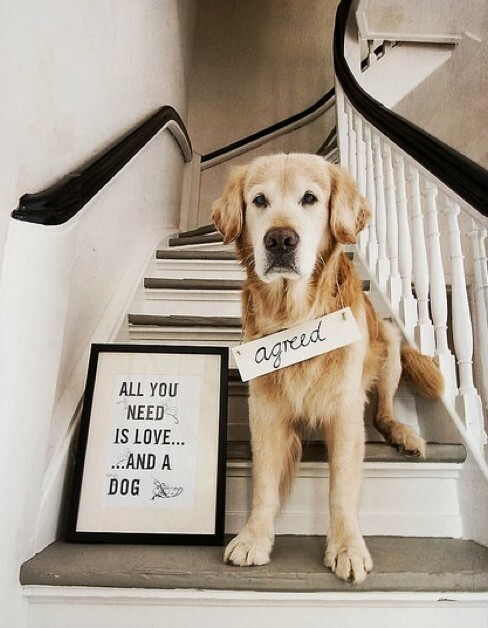 All You Need is Love and a Dog… Mama and I definitely agree. What about you? Dogs are a source of unconditional love. When things go wrong in life, your doggie is always there to give you a kiss, a snuggle, or to lay a reassuring head on your lap. Your puppy loves you no matter what. Your dog doesn’t care if you’re rich, or homeless; if you run Microsoft, or you bag groceries at the local Wal-Mart. When you are sad, your dog is always there to comfort you. He or she will never leave your side. He or she will never desert you. Dogs give you unconditional love and understanding.